Zynga has announced the launch of its latest slot machine in Hit it Rich: Casino Slots. The game is called Dragon’s Bounty, and as of this writing, it’s only available in the Facebook version of the game. 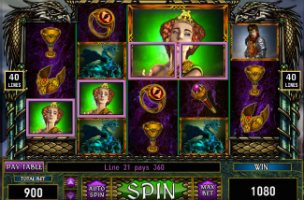 In the machine, players work to earn coins across five reels of medieval and fantasy symbols, from dragons to princesses, with the expected gameplay customization options in place. While playing Dragon’s Bounty, users can choose their bet amount and toggle auto-spin, from 10 to 100 spins at once. Gamers earn experience points for each spin taken, and have access to special bonus games which appear at random. For instance, a dragon egg game sees certain symbols turned into larger “mega” symbols, while gamers also earn free spins. These mega symbols are much larger than individual squares, and can fill up to 12 squares at a single time, helping gamers earn bonus coins. In addition to this new slot machine, a current promotion sees Zynga donate $1 to the Children’s Health Fund for each friend players invite, who accept the invitation. Hit it Rich: Casino Slots is available to play for free on Facebook, and is also available for free on iOS and Android devices. The game is routinely updated with new slot machines, including many for branded properties, including Ted, The Wizard of Oz and Duck Dynasty, among others.